Visiting lecturer, Pedro Dos Santos, makes a strong case for why you should consider learning Portuguese and learning about Brazilian culture. Why should students consider learning Portuguese? Portuguese is the 5th most spoken language in the world. It is spoken in the Americas, in Europe, in Africa and in Asia as a first, second, national or official language. It is the most spoken language in the southern hemisphere! Due to its reach, it is considered a global language, along with English and Spanish. By learning to speak Portuguese, you will be part of a network of more than 250 million speakers, and will be able to read the literature of Luis de Camões, Fernando Pessoa, José Saramago, Machado de Assis and Chico Buarque. You will be able to sing and understand the lyrics of Bossa Nova songs written by Vinicius de Moraes and Tom Jobim, and modern pop songs by Anitta. If your interest is in building up your career, Portuguese will give you an asset that several multinational companies and educational institutions value. But the most fascinating aspects of Portuguese are in the language itself. It has sounds that are not very common in other languages, like nasal sounds that will tickle your nose when you pronounce words like “manhã”, “também”, “bombom”. And although it is a Latin-based language, a vast number of words come from Greek (antropofagia, filosofia, quimera), Arabic (açúcar, azeitona, salamaleico), French (abajur, fechecler, soutiã), African languages (batuque, samba, cafuné) and Brazilian Indigenous languages (mandioca, carioca, piranha). When you learn Portuguese, you will see the world in a different way: in Portuguese, we “have” years of age, and we “are with” a cold or a headache; when you thank someone for doing something to you, you literally say that you are “obliged” to return the favor; if you accidentally hit a vase and it falls on the ground, you just say that “it broke itself” and you get away with no guilt! And if you learn Portuguese, you will often say that you have “saudades” when you miss a person, a place, a dish or a fragrance. Amazing, eh? Would you say Portuguese is “easy” to learn for students who can already speak other Romance languages? It is definitely easier for students who can speak Spanish due to their shared history and the presence of both languages in the Iberian Peninsula. Then, for students who speak Italian or French, the similarities decrease, but there is still an advantage in the fact that those languages are related. If you already speak another Romance language, most of the structures are familiar, like in greetings, when you tell the time, when you conjugate verbs, and even some expressions. What are the advantages of learning about a new culture? Learning about a new culture opens your mind to see and understand the world in different ways. With Brazilian culture, you will learn a lot about society and human relations, about Latin America, and about what it is like to live in a country as big and as diversified as Brazil. You will also learn how the culture is highly influenced by the Tupi, Jê and many other Indigenous peoples who have been in the area for thousands of years and still struggle to survive. It is also influenced by the Angolans, Mozambicans, and many other individuals from South and Central Africa who were enslaved and forced to work there, and whose descendants still face racism. You will learn that not only the Portuguese arrived to “conquer” the area, but also the French and the Dutch, and that many more Europeans settled there in search of a new beginning, keeping their languages and traditions. And you will learn that many Asians, like the Japanese and Lebanese, saw the country as a new place to live and established communities that are the largest ones outside their countries of origin. What do you find most rewarding about your role as visiting lecturer of Portuguese? Teaching Portuguese and Brazilian culture to UBC students is an amazing experience. Our university has multilingual students from everywhere in the world, and when they come to my classes and share their previous experiences with the language or the culture of Brazil, it amazes me. Also, after they take the courses, they report how fascinating the Portuguese language is, or how learning about the Brazilian culture and society has changed their way of seeing the world. I believe that this is the most rewarding part of my role. Portuguese will change the way you see languages and I can assure you that the journey of learning will be extremely pleasant. Pedro Dos Santos is a visiting lecturer appointed by the Brazilian Ministry of Foreign Affairs and the Coordination for the Improvement of Higher Education Personnel (CAPES). This program has been running since 2006 and there are currently 20 other lecturers of Portuguese language and Brazilian culture working at higher education institutions in all the continents. This position at UBC is the first and only Brazilian lectureship in Canada. 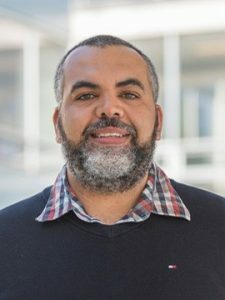 His role is to help promote the courses of the program of Portuguese at UBC, the courses of Portuguese in Lower Mainland, and to create awareness about Portuguese as a heritage language along the Brazilian community.